Speed up your morning routine with this cozy Egyptian cotton towel set by Amrapur Overseas. The textured rib pattern allows for quick drying and each towel is machine washable for easy cleaning. 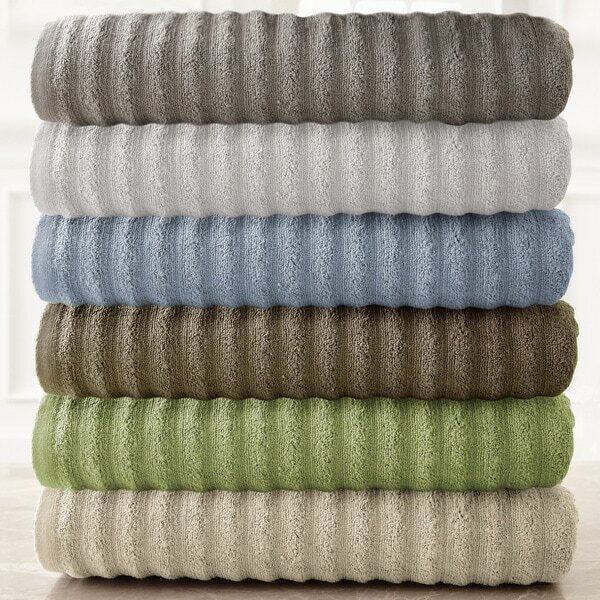 Choose from six soft colors to complement your bathroom decor. The size of the bath towels in this set are stated to be 30x57 in the description given on line. However when received the package they came in states the size to be 27x54. 3" shorter each way. This was disappointing when expecting a larger bath towel. Otherwise the towel set was nice and true to color. Great price for these towels, as I also found these selling on Amazon for $ more per set. Note, however, these are packaged as "Spring Bloom Quick Dry Towels by Pacific Coast" rather than "Amraupur Overseas Wavy Luxury Spa" towels. They are light, absorbent, and quick drying. All a plus. I really like the look and feel of these towels, but after 2 weeks and 2 washings 1 of the bath towels is fraying already. Really disappointed in the quality. Absolutely love this towel. They are 100% Egyptian cotton, soft, great absorption. The wave pattern looks great. The bath towel is a little larger than most bath towels - nice. I chose the Ivory color. It is a little bit more yellow than I expected but completely beautiful. I will definitely purchase additional sets. I love these towels! They are super soft and dry really fast. You definitely want to wash them before using as the tag instructs, I cleaned off a ton of lint from my dryer when I dried them. I purchased the grey and it matches my aqua/white/grey bath set that I already have perfectly. I have been using these towels for over a week now and they are fairly absorbent. I've noticed that when drying my hands on the hand towels it takes a couple of passes across the towel to feel like my hands are completely dry. This is good product. I would've given it five stars but it was lost in the mail and I had to call customer service but right away they handle the situation and a replacement of Wavy Luxury Spa collection quick dry towel was on it way. These towel wash very well and they appears to be made of good quality material and the fact that they dry quickly these towel will be the ones I put in my guest bathroom as well as my kids bathroom. I am very happy with this purchase I would buy again. Stay soft wash after wash and also dry quickly. Just ordered more sets! Only comment is that I wish the "grey" was an actual grey as pictured. It is more of a light taupe as far as I can tell. Have not had a fraying issue with any of the towels I have purchased. I wonder if that issue is due to the machine they are being washed in and the temperature. I wash mine in a front load machine on delicate/cool setting and dry them the same. One of the bath towels was frayed at least 4 inches on one side. The others were fine. Washed them before using and twice more. Lots of lint each time. These feel and look good. They are moderately thick and the wavey pattern help dry you quickly. And then...you wash them. Mine unraveled with the very first time! Colors are good but again, not something I would recommend buying due to poor quality. I got 2 of these in Ivory. When they arrived (separately) they were clearly 2 different versions of the same towel set. One was really soft and plush with a creamy ivory color while the second one was a stiff beige ivory. The packaging and ribbon that its wrapped in were slightly different as well. The print on the ribbon was in a different color. Overall, I liked one of them (plush cream ivory), but not the other. The colors were every bit as beautiful as the pictures. They dry you off very good once I did as the instructions said & washed them before using them. Will buy them again when I need more towels! I always worry when I buy towels. They may be too rough, fray easily, or not absorbent. Not these towels. They are true to the color depicted, absorbs quickly, soft to the touch, have not lost their color after washing, and were priced just right. I highly recommend purchasing these towels. Price is right, good quality, thirsty, but light weight enough to dry in between toes. Uses less energy to dry. Very satisfied. I purchased 4 of these towels the first time because of a few bad reviews. I have since bought more! They are great towels! Very soft, dry quickly and retain their shape. Great price as well. These towels wash and hold up well. Love the feel and thickness of them! Would buy them again! 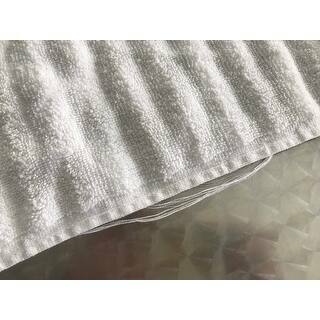 These towels where thick and a ripple texture even after washing them they didn't shrink or change color. The large assortment of colors Amrapur had caught my eye than any other brands. Try them you won't be disappointed. I love these quick dry towels - they do what they say. The 1st dry there is a lot of lint but after that - they are great. They are very soft and absorbent. Love these towels!!! They are dry by morning including the wash cloths. They are stylish, feel good and my hubby loves them!! I bought several sets of the taupe towels a year ago for my AirBnB. I couldn't have been happier, they've stood up to regular washing (sometimes 3 times a week), they're thick and fluffy and have been mentioned in my reviews. So when I needed more towels for home...it was a no brainer, just order these. Unfortunately, the ivory are not as sturdy or thick (or maybe it's just a decrease in manufacturing quality). I've already moved a towel, hand towel and facecloth to the rag bin because the seams have unraveled. Very very disappointing. Just ok. Didn’t hold up as well as other towels I have purchased. The towels were nice, fluffy and absorbent. I ordered two sets. In one set, the hand towel was shredded! Impossible for the packers not to notice! The inspirations is now to not order bath linens from you again. I was cautiously optimistic when purchasing this towel set. The price was right, but I wasn't sure if the quality would be good. Sometimes, less expensive towels don't dry very well. These are great! I washed them before using with 1/2 cup of white vinegar in the "softener" tray of my front load washer. They came out soft, and are very absorbent. They dry fast as well. Now that I've tried them out, I'm going to order several more sets. "In this picture, the grey looks very brownish. Is that the actual color of the sheets?" These are not sheets to start. They are towels. I did not get the grey, thus have no idea what the grey color looks like. "Does the sage color have a grey or yellow (or other undertone)?" I got the blue....and it has a grey undertone. I can only assume the green would also? I washed the blue with some bleach in the wash to reduce the grey. It brightened them up a bit. Nice texture. ...Not as quick dry as some others I have. The sage towels I received have more of a grey undertone. It's a nice clean sage, I'm happy with the color (that was one of my concerns). My towels are great, I'm glad I purchased them... no problems at all. The sage has more yellow tones. The towels are really nice. Mine are more grey overtone, but I did buy grey as well as they accent each other well. Could be more grey because of the combination. more of a gray undertone. "I'm trying to determine which colors will work in my bathroom and I'd like to know if the Spa Blue is lighter or darker in person. Can it be described as sky blue, or baby blue? I'm also curious where on the spectrum is the Grey? There are a couple of images on the website but each one shows the Grey in a slightly different hue - Warm Grey, Cool Grey, and lighter/darker... has anyone purchased these these towels who can speak to their colors? Thanks for your help." I have the Grey and it is a med/light cool grey. And they dry very quickly. Very happy with them. I love the towels but the grey is more like a very light taupe instead of what I consider "grey." The blue is a sky blue color. I have placed orders for several of these sets both for home and cabin. I have not yet encountered the "fraying after washing" problem on the towels I have received and have been very happy with how soft they are and how fast they dry. I would say the blue is more baby blue. I was hoping it had a bit more gray undertone, but it doesn't. Still, they are great towels. Happy with purchase. "(Yes Cathy, I meant "towels" not "rugs". Thanks for calling that out.) How are the actual colors of the towels, in comparison to their pictures on the website? The images of the towels appear more saturated, and I'm wondering if they're lighter and less saturated in person. For example, the taupe color looks very dark and greenish, and the grey looks "warm" in the photos. Thanks!"" I purchased the taupe and the color is true no greenish tone at all. They wash nicely I've had mine for about 6 months and they still look new! I have the taupe, its almost a gray color, I wouldn't say green, I would say pretty much close to what u see when all colors r stacked in pic,together, maybe slightly lighter but not by much, they are nice towels, seems like they get better as u wash them, fluffier. "How are the actual colors of the rugs, in comparison to their pictures on the website? The images of the rugs appear more saturated, and I'm wondering if they're lighter and less saturated in person. For example, the taupe color looks very dark and greenish, and the grey looks "warm" in the photos. Thanks!" Do you mean the towels? If so I can only speak to the color I bought which is the Sage green. It is a little less bright in person, more toned down compared to the image online. im sorry, I thought the taupe color was what I got, I got gray because it came closer to the taupe then taupe, that looks more dark brown from pics, gray is close to taupe I would say, from reviews alot of PPL said same thing , that's what made me get gray for the taupe color,im happy with it. "Do these towels have dooby borders?" No, they don't have dobby borders. Just plain borders. "The color option "Ivory" looks more off-white/ less yellow in the product photo showing all the towel colors (than in the photo showcasing just the ivory set), and in the product specs, the color choice is listed as "off-white," not "ivory." I imagine this is the same color choice. Can anyone tell me if the ivory choice is more off-white or light yellow? Thanks in advance." I don't know about the Ivory but the gray ones we ordered were not the same color as the picture. They are almost taupe - more of a brownish gray than the picture showed. My son likes the quality but the color was not at all like the photo.